SEBASTIAN AHO (20) skates on the ice after being awarded the games first star when the Vancouver Canucks visited the Carolina Hurricanes. The Hurricanes won 5-3. 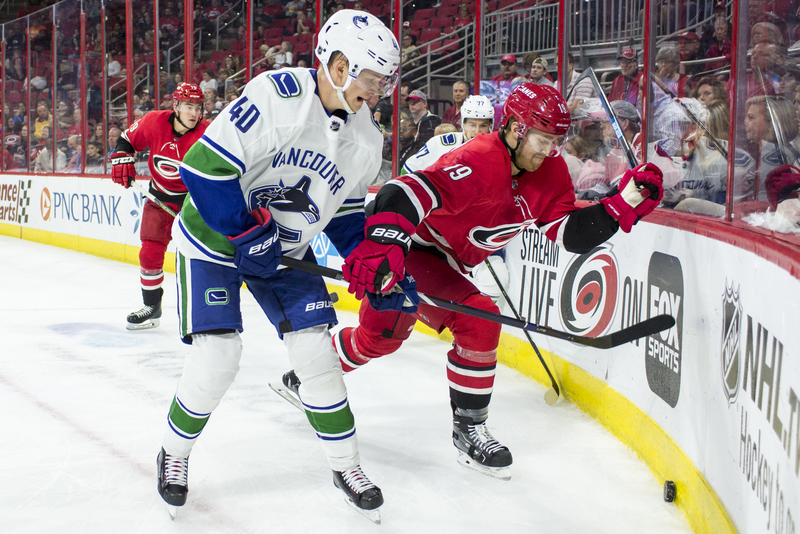 BROCK BOESER (6) puts a shot on goal during a game between the Carolina Hurricanes and the Vancouver Canucks. The Hurricanes won 5-3. ELIAS PETERSSON (40) and DOUGIE HAMILTON (19) battle for a puck in the corner during a game between the Carolina Hurricanes and the Vancouver Canucks. The Hurricanes won 5-3. 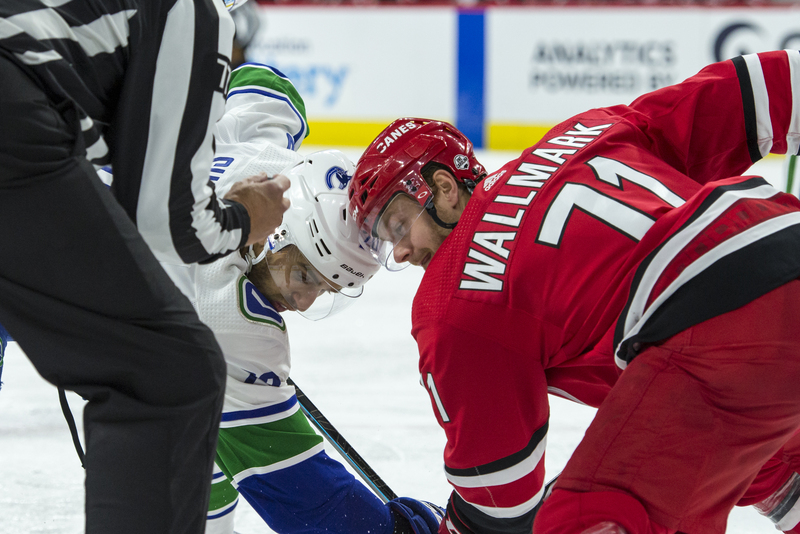 LUCAS WALLMARK (71) AND BRANDON SUTTER (20) line up for a faceoff during a game between the Carolina Hurricanes and the Vancouver Canucks. The Hurricanes won 5-3. JUSTIN FAULK (27) lines up before a faceoff during a game between the Carolina Hurricanes and the Vancouver Canucks. The Hurricanes won 5-3. 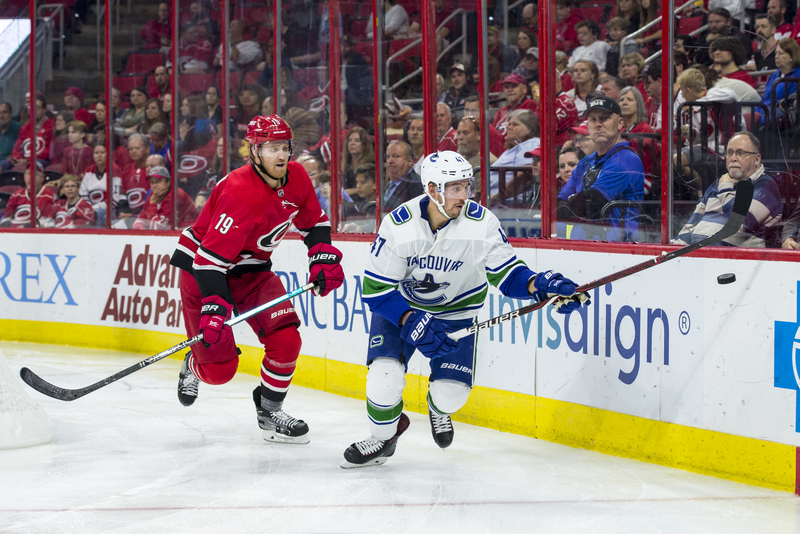 SVEN BAERTSCHI (47) and DOUGIE HAMILTON (19) battle for the puck in the corner during a game between the Carolina Hurricanes and the Vancouver Canucks. The Hurricanes won 5-3. 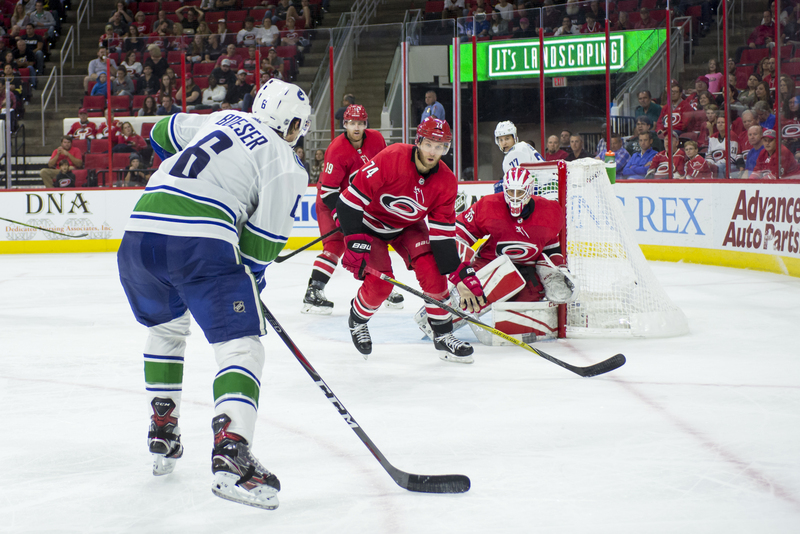 RALEIGH NC-The Carolina Hurricanes faced the visiting Vancouver Canucks on Tuesday night at PNC Arena. Coming into the game, the Hurricanes were 2-0-1, while the Canucks were 1-1-0. The Canes have started out hot with an overtime loss to the Islanders and back to back wins against the Columbus Blue Jackets and New York Rangers. Carolina started Curtis McElhinney at goalie after two poor starts from Petr Mrazek. The 11,932 in attendance were treated to an action pack night, that would not disappoint. First-period action was fast and quick, with both offenses showing their power early. Less than a minute in, alternate captain, Jordan Staal, would secure the first goal for Carolina and his third of the season. Vancouver would match with a goal of their own, by forward Sven Baertschi who tied the game 1-1 with 10 minutes left in the first. He was assisted on the wrist shot by Alexander Edler and Christopher Tanev. The game would not be tied for long, when Brett Pesce served a slapshot to the left corner of the net, putting the Canes up 2-1. He would be assisted by Teuvo Teravainen and Sebastian Aho. Carolina would post one more goal, by Aho. 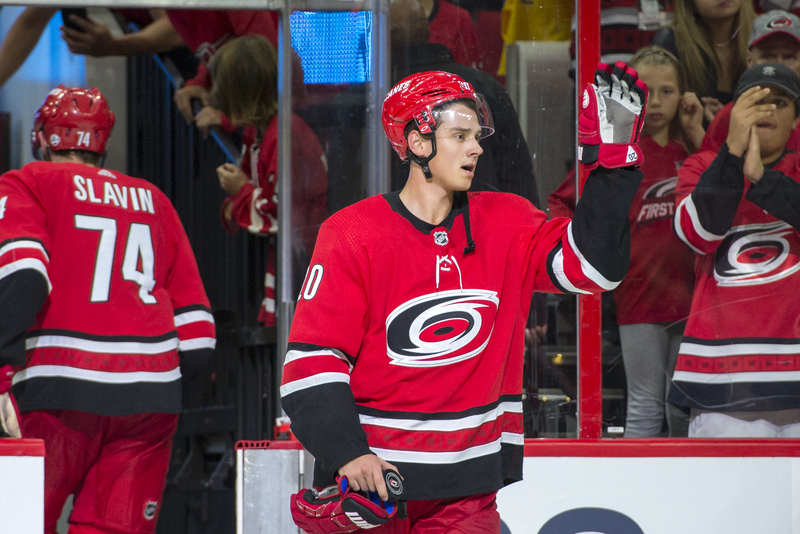 This would be Aho’s sixth point of the season. Teuvo Teravainen and Micheal Ferland would obtain the assist. The period would end 3-1 with the Hurricanes on top. The second period continued the offensive play from the first period. However, the Canucks would be the first to strike in the opening minute with a power-play goal by Bo Horvat and the assist by Baertschi and Brock Boeser. Baertischi would go on to secure his second goal of the game two minutes later off of a deflection. The Canes would grab back a one-goal lead after Andrei Svechnikov, the second pick in the 2018 NHL Draft, acquired his second goal of the season, being assisted by Jaccob Slavin and Dougie Hamilton. After the explosive five minutes of starting action, both defenses held strong until the horn blew. The score would read 4-3 heading into the third period. Defense was the staple for both teams the first 10 minutes of the last period. Neither team would incur a penalty or goal. However, the Hurricanes would find the net one last time after an incredible slap shot by Warren Foegele. He would be assisted by captain Justin Williams and Staal. This would be Foegele’s third goal of the season through four games. Vancouver tried their hardest to muster up a late comeback, however, it did not happen. The game would end 5-3 with the Hurricanes securing their third win of the season. The Hurricanes looked strong on offense with 33 shot attempts taken. Power-plays however, have been an issue for the Hurricanes. They are 1-9 (.11%) on the advantage throughout the season so far and should look for better opportunities during the two-minute advantage. On defense, the Canes started off rocky but found their stride down the stretch. If Carolina can keep up the impressive play, they can be a true threat in the Metropolitan Division. 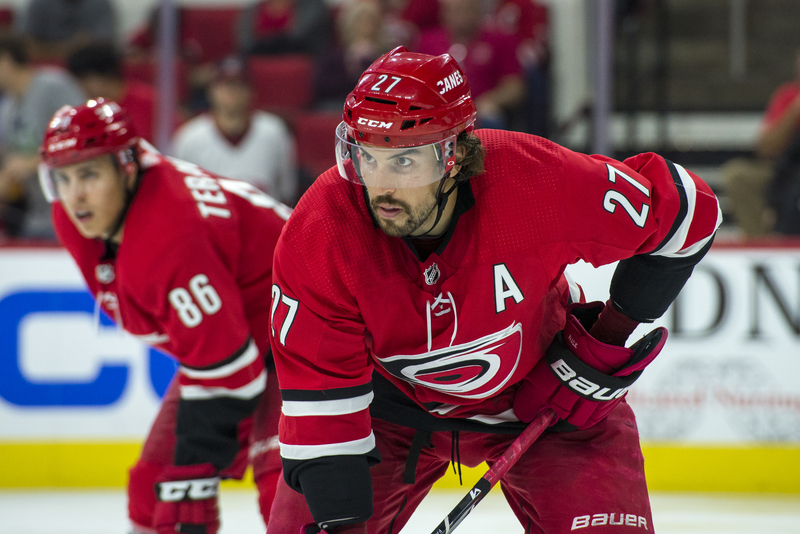 The Hurricanes will now go on a three-game road trip until they come back to Raleigh to play the Colorado Avalanche on the 20th of October.